This was awesome Bill,great job was a good/funny read,just went to the trib and PD corrected his error on the morning update,now reads TIED a record on his blog. @Anonymous @Big Daddy Glad you enjoyed it. Sometimes I think I'm getting pretty far "out there." :-) Also, PD may have corrected his headline but deep in the text, he still has it wrong. That this was a great write-up. I'm normally up past midnight, but missed out on all the excitement when I fell asleep early last night. 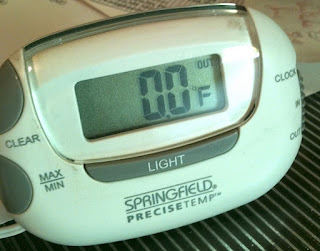 However, I was seeing if the temp could stay below zero until noon. I believe McDonald's is running a promotion where if you buy an egg McMuffin or a Big Mac, you can get a 2nd one for the cost of the Noon temperature the day before. 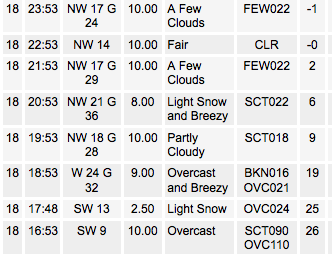 I think we were at negative 2 degrees at Noon at MSP yesterday. I was definitely surprised to see double digits below zero yesterday morning. 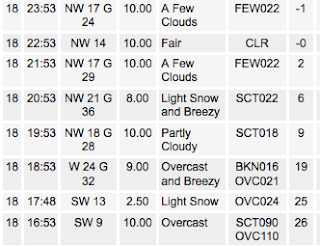 Flakes flying in Eden Prairie and down right cold,2 above,who ever said its too cold for snow! Very entertaining. In the meantime, the radar shows the snow drying up all around the metro. If the radar is correct...unbelievable! An hour there was a solid snow band everywhere south of St. Cloud. I don't like the way the GFS is handling the Sunday/Monday storm. It appears to be the outlier. It shows a strong 500mb vortmax AND a major league trough digging into the southern Plains yet no surface low pressure system to accompany them? I don't like it. Gut feeling is that the Euro's are onto something when they develop a classic Winter Storm over the Upper Midwest and surface low that tracks from KS to WI. This will be a fun situation to discuss later today & during the weekend. "THE GFS SEEMS LIKE A DECENT COMPROMISE. WILL LEAN ON A GFS/CONSENSUS SOLUTION IN THIS TIME FRAME FOR NOW." This afternoon's AFD for La Crosse is now starting to lean towards the Euro's outlook.